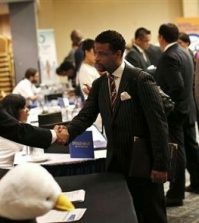 (Reuters) – The number of Americans claiming new jobless benefits hit a three-month low last week and contracts to buy existing homes rose in June, hopeful signs for an economy that has struggled to regain momentum. Initial claims for state unemployment benefits dropped 24,000 to 398,000, the Labor Department said on Thursday, below economists’ expectations for a fall to 415,000. A separate report from the National Association of Realtors showed pending home sales rose 2.4 percent in June, the second straight monthly increase. Contracts usually lead sales by a month or two. 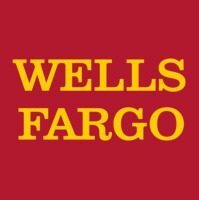 The reports offered some relief after a recent string of weak data, which had shown the economy closing out the first half of the year on a soft note. A deadlock in Washington over raising the nation’s debt limit has hurt sentiment. “Claims provide some hints that the economy is going to do better in the third quarter,” said Michael Strauss, chief economist at Commonfund in Wilton, Connecticut. U.S. stocks rose on the data, a day after posting their biggest fall in eight weeks. Prices for Treasuriesalso increased despite fears of the government defaulting on its debt, while the dollar fell against a basket of currencies. The government is expected to report on Friday the economy grew at an anemic 1.8 percent annual rate in the second quarter, according to a Reuters survey, a touch slower from the already weak 1.9 percent first-quarter pace. The weak economy hurt domestic sales of consumer companies such as Colgate-Palmolive Co and Avon Products Inc in the second quarter. However, Colgate Chief Executive Ian Cook said on Thursday that business in the United States got off to a healthy start in July. While the rise in pending home sales was encouraging, there has been an increase in contract cancellations because of problems with property valuations and tight lending standards, and high cancellations had pushed down home resales in June. “The pickup in pending home sales might not necessarily end up in a measurable pick up in mortgage closings and translate into a healthy increase in existing home sales,” cautioned Yelena Shulyatyeva, an economist at BNP Paribas in New York. The weak housing and labor markets are high on the list of factors frustrating the economy’s recovery from the 2007-09 recession. The labor market took a beating in May and June, with nonfarm payrolls increasing only 43,000 over the two months. But the dip in claims below the 400,000 mark offered reason for cautious optimism. “The recent softness in the labor market may be beginning to subside,” said Troy Davig, a senior economist at Barclays Capital in New York. A four-week moving average of claims, considered a better measure of labor market trends, fell 8,500 to 413,750, while the number of people still receiving benefits under regular programs after an initial week of aid declined 17,000 to 3.70 million in the week ended July 16. Data for the so-called continuing claims covered the survey week for the household survey from which the unemployment rate is derived. 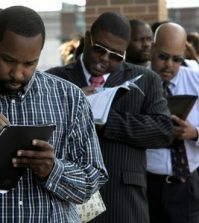 The jobless rate rose to 9.2 percent in June from 9.1 percent in May.